The Pauling scale is a convenient way to compare the electronegativity of two or more atoms. An atom’s electronegativity is the attractive force it has for an electron. The Pauling scale gives a relative magnitude for this attraction. Linus Pauling, the Nobel winning chemist, contributed enormously to areas of chemistry such as molecular bonding theory. He devised this scale with the maximum electronegativity set to 4.0. Fluorine is the most electronegative atom and has a Pauling value of 4.0. Francium, on the opposite corner of the periodic table from Fluorine, as the lowest Pauling value for any of the elements, and is 0.7. If two atoms have a large difference in their Pauling values, then they are more likely to form ionic bonds since one of the pair will have a much greater attraction for an electron then the other. If on the other hand, the pair of atoms have very similar values, then they are likely to form covalent bonds, since both atoms have equal or close to equal attraction and therefore share the electron between them. Even in covalent bonds, unless the two atoms involved are of identical type there will still be a subtle difference in electronegativity that will create an imbalance in the location of electrons in that bond. This is a polar bond, and accounts for a lot of interesting chemistry to occur due to placing a partial negative charge on one atom and a partial positive charge on the other. The atoms on the periodic table are not sitting randomly with respect to their electronegativity . 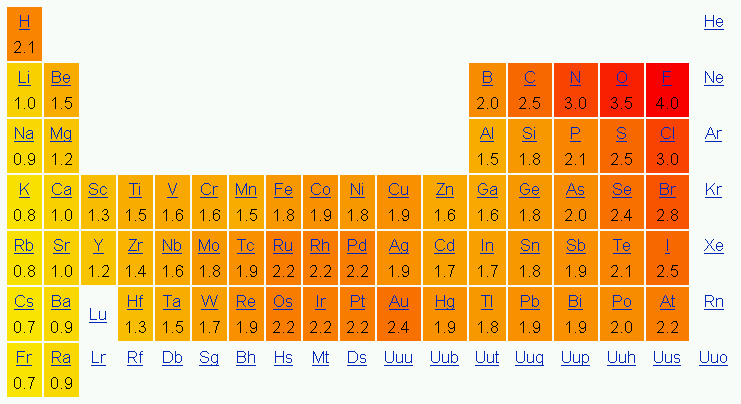 One of the many valuable features of the periodic table is that you can predict, based on location in the table, which elements will have higher or lower Pauling values than other elements found at other locations on the table.